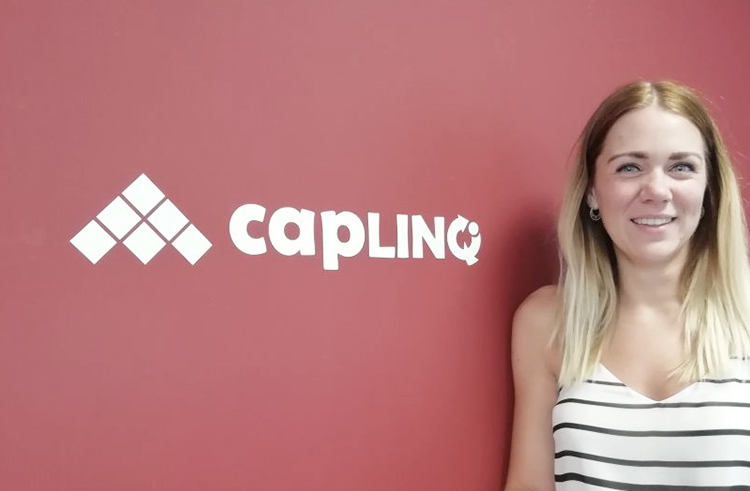 From the 1st of July 2018, Mar­jette Oost­er­veen will join CAPLINQ’s Cus­tomer Ser­vice Depart­ment as our new Cus­tomer Ser­vice Rep­re­sen­ta­tive and Process Admin­is­tra­tor. Work­ing full time out of our offices in Heemskerk, Nether­lands, Mar­jette will sup­port us and our cus­tomers so that we can pro­vide an even bet­ter ser­vice and cus­tomer expe­ri­ence. Mar­jette has sev­er­al years of cus­tomer ser­vice expe­ri­ence work­ing with­in dif­fer­ent sec­tors and indus­tries. She is a native ‘Heemskerkse’: born and raised in Heemskerk, Nether­lands. Pas­sion­ate about team sports: in her spare time she’s an ama­teur foot­baller for her local women’s team. She start­ed out play­ing foot­ball at her local club: ADO’ 20, back in 2002 when she was 14 and con­tin­ued to play until she was 24. From then on, Mar­jette moved from play­ing on out­door grass pitch­es to indoor foot­ball; play­ing instead inside De Wat­er­akkers for her team: ‘Fit met Visie’. So, as you can tell, Mar­jette is an ama­teur foot­ball star in her local com­mu­ni­ty. At CAPLINQ, we feel her back­ground and char­ac­ter make her per­fect for this posi­tion. So please join me in wel­com­ing Mar­jette to this new cus­tomer ser­vice and process admin­is­tra­tion posi­tion. Let’s wish her a long and suc­cess­ful career with CAPLINQ. CAPLINQ is a spe­cial­ty chem­i­cals, plas­tics, and prod­ucts com­pa­ny that spe­cial­izes in mak­ing for­eign com­pa­nies com­pete on a lev­el play­ing field with Euro­pean sup­pli­ers. With more than 300MT year­ly of chem­i­cals and plas­tics com­ing through Rot­ter­dam in the Nether­lands and a staff of engi­neers and tech­ni­cal rep­re­sen­ta­tives, CAPLINQ is a mod­ern-day mar­ket part­ner. Using dig­i­tal-age tools and the same legal tech­niques multi­na­tion­als use, we cre­ate a Euro­pean pres­ence for for­eign com­pa­nies with­out them requir­ing to set up a Euro­pean enti­ty. We do this with four pri­ma­ry ser­vices: our order ful­fill­ment Europe ser­vice, our tech­ni­cal rep­re­sen­ta­tion ser­vice, our tech­ni­cal mar­ket­ing ser­vice and our REACH Only Rep­re­sen­ta­tive ser­vice.